OK, this video, we're dealing with another reverser or shifting sentence, and we, of course, want to note this new word here; that is, "however". This is another reverser. So let's read the sentence. 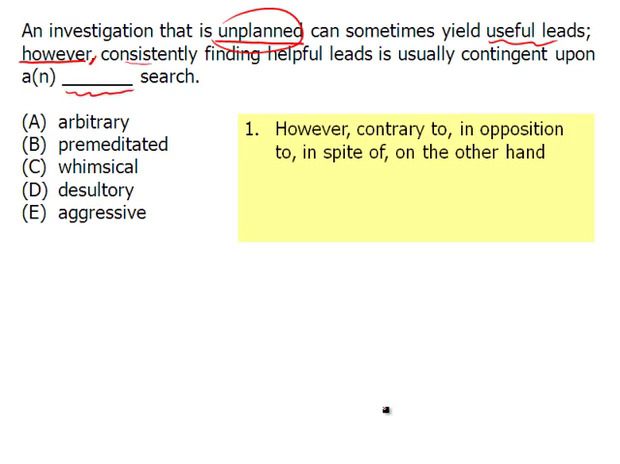 "An investigation that is unplanned can sometimes yield useful leads;" The clue word here is "unplanned". You have this unplanned investigation sometimes helpful. However, so note, there's that reverser. So we are going to take that clue word, and we are going to come up with the opposite. So, "consistently finding helpful leads is usually contingent or based upon a _______ search." Again, note structure here. So we have our words, "however", and then break down the sentence, and then, of course, we know the structure. That is, the opposite of unplanned here is a planned search. Again, that structure is we have a reverser. That reverser is separated, in this case, by both the semicolon and a comma. But we know that the first part of the sentence, starting with " an investigation" and going to here, that is, to "useful leads", is opposite from the part beginning here and ending with "search". Again, the clue word is unplanned. Therefore, that's contrasted with a planned search. Now, of course, we match once we oppose the keyword. We match by oppose the keyword. The clue word is unplanned, and therefore, let's go through the answer. We have arbitrary. Arbitrary means random, without a purpose. We want planned. Premeditated. If you were premeditated, you think before you do something. You plan. And just like that, there's our answer. Whimsical means playful, and this fanciful unpredictable sort of way doesn't work. Desultory means rambling and unplanned and is a good GRE word to know, but it is not the answer. Aggressive, of course, does not mean planned. Just like that, we've identified the structure. We found the clue. We've opposed or come up with the opposite of the clue. In this case, it's unplanned. We have planned, and then we match our answers.